Atmosera provided the expertise to properly assess our needs, deploy the Azure environments and now operates them 24x7 enabling our team to focus on our business without worrying about our underlying systems. Atmosera, a premier Tier-I Microsoft Cloud Solution Provider (CSP), today announced a record year for growth on the heels of Microsoft’s fiscal year closing. 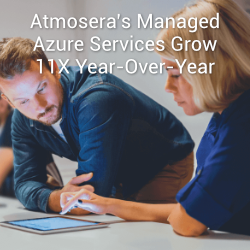 Atmosera’s more than three-year investment in the CSP program has resulted in impressive momentum over the last 12 months with a 3X increase in revenue across all Microsoft Cloud services and 11X gain for Managed Azure Services. Atmosera’s strong performance mirrors the market acceleration toward cloud services, and is complemented by operational achievements, partner traction, and demand from small and medium enterprises for managed cloud solutions. The overall market demand for cloud-based IT services continues to grow at a steady pace according to analysts: in 1Q17, Gartner predict[ed] a five-year growth rate of 15.9% through 2021 for the cloud market. (1) Atmosera Managed Azure Services provides a comprehensive set of cloud-based services supported 24x7x365 by a team of experts. The company architects, deploys, and operates public, private, and hybrid Azure cloud environments that support a diverse set of business applications, mission-critical workloads, and operations anywhere in the world. Atmosera is a Gold-level Microsoft Cloud Platform and Cloud OS Network (COSN) certified partner and was one of the first Microsoft Cloud Solution Providers (CSP) to leverage the Microsoft Cloud Platform and deliver solutions to customers. Atmosera’s success covers many industries and geographies with customers located throughout North America. As part of the company’s growing customer base, Atmosera has seen a 2X increase in the number of small and medium enterprise customers who have migrated away from traditional on-premise environments in favor of cloud-based infrastructure to power business applications. Microsoft has recognized Atmosera’s success in the category and recently published two case studies featuring Atmosera Managed Azure Services. Microsoft also recently presented Atmosera with the 2017 US SMB Rising Star Northwest Partner of the Year award at the Microsoft Inspire conference in July. With Managed Azure Services, customers have the flexibility to implement public, private, and hybrid Azure environments that modernize existing IT systems, eliminate management complexity, improve security and reliability, and optimize IT investments. Atmosera accelerates the deployment of these environments for customers, providing a much better alternative to monolithic three-tier IT infrastructure that leverages PaaS and microservices to optimize IT for business. With over 20 years of industry experience, Atmosera is a leading provider of business-class cloud enablement. Award-winning Atmosera Managed Azure Services simplify the process of transitioning from legacy three-tier IT architecture to the Microsoft Cloud Platform for improved IT transparency, security, and trust. The company supports mid-market companies and enterprises as well as application developers in the planning and execution of smarter cloud computing investments for more scalable and responsive IT infrastructure. Atmosera together with Microsoft’s modern, open, flexible and secure environments delivers a foundation for cloud strategies that are aligned to meet unique customer requirements. With hundreds of customers worldwide, including Blount International, Icebreaker, and Lattice Semiconductor, Atmosera service capabilities span the globe and reach across every business sector. To learn more about Atmosera Managed Azure Services, please visit https://www.atmosera.com/managed-azure/ or call +1.800.903.4852.